Holy Communion 8.00am. 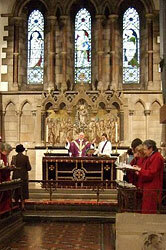 Sung Eucharist (2nd, 3rd, 4th and 5th Sunday of the month) 10.00am, Said Eucharist - All Age Worship (1st Sunday) 10.00am. Holy Communion (4th Sunday) 12 Noon. Evensong 5.00pm (not July and August). Monday to Friday: Morning Prayer 8.15am.